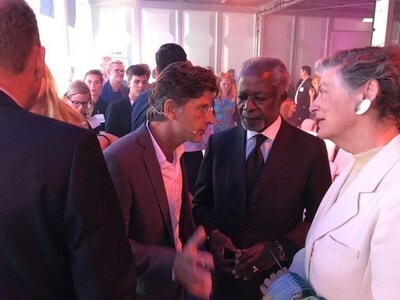 In the presence of former UN-Secretary-General Kofi Annan and Dutch minister Melanie Schultz of Infrastructure & the Environment, Micreos' alternative to antibiotics was chosen as the most impactful innovation of The Netherlands. Micreos will represent The Netherlands at the semi-finals of Ideas from Europe in Talinn, Estonia on November 22 2017. Micreos' endolysin technology, enabling targeted killing of only unwanted bacteria - regardless of antibiotic resistance - was selected by a professional jury. Jury-chair Kasja Ollongren, Deputy mayor of Amsterdam, emphasized the impact Micreos' products can have for millions of people. The Making Waves-conference was attended by hundreds of policy makers, entrepreneurs, investors and developers. Guest of honour, Kofi Annan, winner of the Nobel Peace Prize, said: "I am really excited about Micreos' alternative to antibiotics". Kasja Ollongren: "We chose Micreos because the company's technology is already helping tens of thousands of people and we're convinced Micreos' alternative to antibiotics can be life-changing for millions." Micreos CEO Mark Offerhaus: "Antibiotic-resistance is an enormous global problem. We are honoured with the recognition. Gladskin has already been life-changing for people suffering from inflammatory skin diseases such as eczema, acne, rosacea and wound infections caused or aggravated by the Staphylococcus aureus bacteria, including the resistant MRSA. But as far as we're concerned, this marks only the beginning. Our endolysin technology offers a real and sustainable alternative to antibiotics, the broad potential of this technology is immeasurable. There's no need to wait and no time to lose." Ideas from Europe is a European platform aimed at promoting the development of ideas for society's major challenges. The platform meets in November in Talinn, during Estland's tenure as EU chair. The concept behind Ideas from Europe / Making Waves is that the involvement of the public at large can propel relevant breakthrough innovations. Micreos develops endolysin- and phage technology that enables targeted killing of only unwanted bacteria. The company is considered the leader in this exciting new field. Micreos runs its own production and R&D centre for endolysins in Bilthoven and for phages in Wageningen 'Food Valley'. Micreos' head office is in The Hague. The company works together with ETH Zurich and numerous medical and technology centres, including Erasmus MC (Rotterdam), Boston Childrens' Hospital, Public Health Lab Kennemerland, the Dutch Burn Centres (Beverwijk) and many others. Gladskin is a Micreos Human Health product (http://www.gladskin.com). Micreos Food Safety produces the FDA approved products PhageGuard L, against Listeria, en S, against Salmonella (phageguard.com).